Manuscripts and Books and Reissues, Oh My! Needless to say I think it will sell, and am very pleased I can finally share it with you. May your imagination have wings today. It is simply gorgeous, Robin. Robin this is beautiful! I just finished Sorceress of Faith yesterday (loved that she went back to Earth, resolved things there and went "home" again) so this is prefect timing. 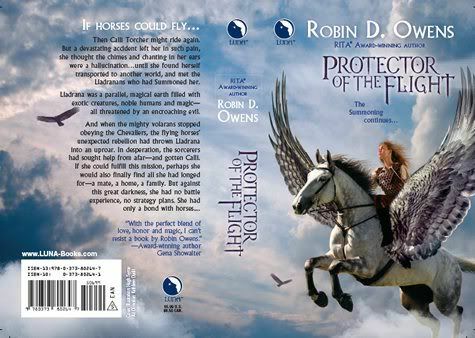 Thanks, yes I like the cover very much and definitely wrote some scenes where I have Calli experiencing the wonder of flying. I didn't mean you to squint for the back cover copy, I'll type it up for you one of these days. Wow...it's gorgeous! And sounds irresistible, too. Can't wait. Wow, Robin, this is an amazing cover. I love it. I'm partial to Greek mythology and since I happen to have a tatto of Pegasus on my shoulder, you gotta know that this cover draws me right in. Can't wait to read the book.